It's Pete and Ramon back for two weeks worth of comic reviews! The CW crossover just finished, and the boys are gonna' tell you all about it (with as few spoilers as possible) The rest of our comic book TV shows are drawing closer to their winter break, and we'll bring you up to speed. Meanwhile on the printed page, John Layman's Chew finishes its epic 60-issue run. And what a series it was! A Must-Read if ever the boys have read one! Marvel' NOW's new Venom book is a surprise hit, along with Black Mask's No Angel by Agents of SHIELD's own Adrianna Palicki and her brother Eric! 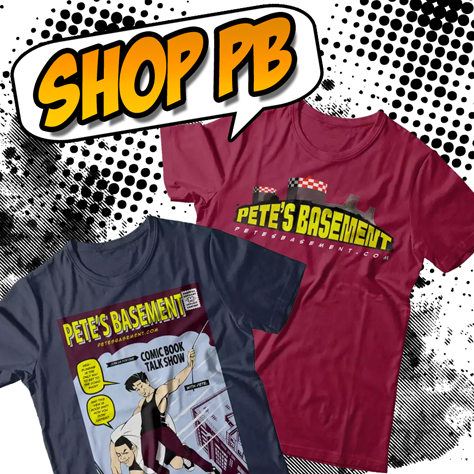 It's a double-sized Pete's Basement episode as the boys have three -- count 'em - THREE weeks worth of books to cover! Joining the likes of Black Panther, Grizzly Shark, and Hot Damn are The Three Stooges, Teddy Roosevelt in The Rough Riders, and a heart transplant gone slightly awry in Heartthrob! The boys talk The Walking Dead and the consequences attached to an ending like that!